This is the 2nd attempt at making the planet with the improved textures. Firstly is its a whole lot better than the last one you can actually see his eyes properly, 2nd is his headpiece looks much better with the nice texture on it it does look like saturn rings. 3rd is that his face looks more balanced you can see the light colours now and not right around the back if it. 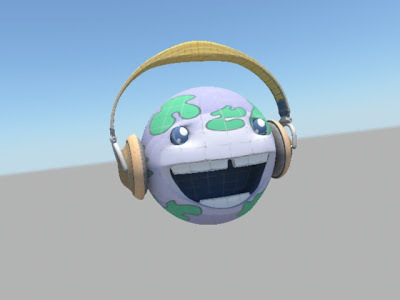 his headphones actually look like headphones and not a mess with that nice chrome texture on top of it. However he is not finished yet!!! there are still a few things needed to be done, i had to get rid of the grid lines so they wont show up like they have here. I then had to put some more reflection in the eyes to give more oomf. Theres an annoying blue bit under the headphone if you look to the left piece you can see it just under the headpiece so i had to fix that up. Also i was not happy with the thickness of the lines for the islands on the planet so i have changed that too and gave it a nice brown colour. SO now that it is fixed up its time to animaaaaate but first is the blend shapes which will be up within the next week or so. The 2nd 250 Word Abstract.